In order to demonstrate how to use Service Builder, let’s create an example portlet project that Nose-ster, a fictitious organization, can use to schedule social events. For our example, we’ll create a new Liferay portlet project for managing and listing these events. We’ll define two entities: events and locations. The event entity represents a social event that can be scheduled for Nose-ster, while the location entity represents a location at which a social event can take place. Since an event must have a location, the event entity will reference a location entity as one of its attributes. If you’d like to examine the finished example project, it’s a part of our Dev Guide SDK which you can browse at https://github.com/liferay/liferay-docs/tree/6.1.x/devGuide/code/devGuide-sdk. The project is in the SDK’s portlets/event-listing-portlet folder. Note: If you’re looking for a fully-functional portlet application that can manage events, please use Liferay’s Calendar portlet instead. The example described in this section is only intended to demonstrate how to use Service Builder. The Calendar portlet provides many more features than the simple example application described here. For information about the Calendar portlet, please refer to the chapter on Liferay’s collaboration suite in Using Liferay Portal. Liferay portlet projects can contain multiple portlets. We’ll create two portlets in our Event Listing portlet project: the Event Listing portlet and the Location Listing portlet. These portlets will allow users to add, edit, or remove events or locations, display lists of events or locations, search for particular events or locations, and view the details of individual events or locations. Figure 4.1: The Event Listing portlet lets you add and modify Nose-ster social events. The portlet relies on its event and location entities and the service infrastructure that Liferay Service Builder builds around them. Create the Event Listing portlet project in your Liferay Plugins SDK using Liferay IDE or Developer Studio, following the example in the Creating New Liferay Projects section. Create the the Location Listng portlet and Event Listing portlet in the project you just created by following the example in the Creating Plugins section. Now that you’ve finished creating the example project and portlets, expand your project’s docroot/WEB-INF/src folder and the com.nosester.portlet.eventlisting package. Notice that Liferay IDE created the EventListingPortlet.java and LocationListingPortlet.java files in this package. We’ll add some business logic to these portlet classes after using Service Builder to create a service layer for our event and location entities. Create the service.xml file in your project’s docroot/WEB-INF folder. Define global information for the service. Define the columns (attributes) for each service entity. Define a default order for the entity instances to be retrieved from the database. Define finder methods that retrieve objects from the database based on specified parameters. Let’s start creating our service by using Liferay IDE to create your service.xml file. To define a service for your portlet project, you must create a service.xml file. The DTD (Document Type Declaration) file http://www.liferay.com/dtd/liferay-service-builder_6_1_0.dtd specifies the format and requirements of the XML to use. You can create your service.xml file manually, following the DTD, or you can use Liferay IDE. Liferay IDE helps you build the service.xml file piece-by-piece, taking the guesswork out of creating XML that adheres to the DTD. For our tutorial, we’ll use Liferay IDE to build the service.xml file. To create the service.xml file using Liferay IDE, select your event-listing-portlet project in the Package Explorer and then select File → New → Liferay Service Builder. Liferay IDE creates a service.xml file in your docroot/WEB-INF/src folder and displays the file in Overview mode. Liferay IDE also provides a Diagram mode and a Source mode to give you different perspectives of the service information in your service.xml file. Diagram mode is helpful for creating and visualizing relationships between service entities. Source mode brings up the service.xml file’s raw XML content in the editor. You can switch between these modes as you wish. Since Overview mode facilitates creating service elements, we’ll use it while creating our service. Let’s start filling out the global information for our service. The package path specifies the package in which the service and persistence classes are generated. The package path we defined above ensures that the service classes are generated in the com.nosester.portlet.eventlisting package under the docroot/WEB-INF/service folder. The persistence classes are generated in a package of that name under the docroot/WEB-INF/src folder. The complete file paths for the service and persistence classes are docroot/WEB-INF/service/com/nosester/portlet/eventlisting and docroot/WEB-INF/src/com/nosester/portlet/eventlisting, respectively. Please refer to next section, Generating the Services, for a description of the contents of these packages. Liferay Portal uses these scripts to create database tables for all the entities defined in the service.xml file. Service Builder prepends the namespace to the database table names. Since our namespace value is Event, the names of the database tables created for our entities start with Event_ as their prefix. The namespace for each Service Builder project must be unique. Separate plugins should use separate namespaces and should not use a namespace already used by Liferay (such as Users or Groups). Check the table names in Liferay’s database if you’re wondering which namespaces are already in use. As the last piece of global information, enter your name as the service’s author in your service.xml file. Service Builder adds @author annotations with the specified name to all of the generated Java classes and interfaces. Save your service.xml file to preserve the information you added. Next, we’ll add entities for your service’s events and locations. Entities are the heart and soul of a service. Entities represent the map between the model objects in Java and the fields and tables in your database. Once your entities are defined, Service Builder handles the mapping automatically, giving you a facility for taking Java objects and persisting them. For this example, you’ll create two entities–one for events and one for locations. To create these entities, select the Entities node under the Service Builder node in the outline on the left side of the service.xml editor in Overview mode. In the main part of the view, notice that the Entities table is empty. Create an entity by clicking on the Add Entity icon (a green plus sign) to the right of the table. Enter Event for your entity’s name and select both the Local Service and the Remote Service options. Create a second entity named Location and select the Local Service and the Remote Service options for it too. Figure 4.2: Adding service entities is easy with Liferay IDE’s Overview mode of your service.xml file. An entity’s name is used to name the database table for persisting instances of the entity. The actual name of the database table is prefixed with the namespace; for our example, we’ll have one database table named Event_Event and another named Event_Location. Setting the local service attribute to true instructs Service Builder to generate local interfaces for our entity’s service. The default value for local service is false. The design of this portlet, however, dictates that we be able to call the service, and it resides in our portlet’s .war file. Our portlet will be deployed to our Liferay server. So the service will be local from our Liferay server’s point of view. Setting the remote service attribute to true instructs Service Builder to generate remote interfaces for the service. The default value for remote service is true. We could build a fully-functional event listing application without generating remote services, so we could set local service to true and remote service to false for both of our entities. Since, however, we want to demonstrate how to use the web services that Service Builder generates for our entities, we’ll set both local service and remote service to true. Tip: Suppose you have an existing DAO service for an entity built using some other framework such as JPA. You can set local service to false and remote service to true so that the methods of your remote -Impl class can call the methods of your existing DAO. This enables your entity to integrate with Liferay’s permission-checking system and provides access to the web service APIs generated by Service Builder. This is a very handy, quite powerful, and often used feature of Liferay. Now that we’ve created our Event and Location entities, let’s describe their attributes using entity columns. Each entity is described by its columns, which represent an entity’s attributes. These attributes map on the one side to fields in a table and on the other side to attributes of a Java object. To add attributes for the Event entity, you need to drill down to its columns in the Overview mode outline of the service.xml file. From the outline, expand the Entities node and expand the new Event entity node. Then select the Columns node. Liferay IDE displays a table of the Event entity’s columns. Service Builder creates a database field for each column we add to the service.xml file. It maps a database field type appropriate to the Java type specified for each column, and it does this across all the databases Liferay supports. Once Service Builder runs, it generates a Hibernate configuration that handles the object-relational mapping. Service Builder automatically generates accessor methods in the model class for these attributes. The column’s Name specifies the name used in the getters and setters that are created for the entity’s Java field. The column’s Type indicates the Java type of this field for the entity. If a column’s Primary (i.e., primary key) attribute value is set to true, then the column becomes part of the primary key for the entity. An entity’s primary key is a unique identifier for the entity. If only one column has Primary set to true, then that column represents the entire primary key for the entity. This is the case in our example. However, it’s possible to use multiple columns as the primary key for an entity. In this case, the combination of columns makes up a compound primary key for the entity. Create each attribute by clicking the add icon. Then fill in the name of the attribute, select its type, and specify whether it is a primary key for the entity. While your cursor is in a column’s Type field, an option icon appears. Click this icon to select the appropriate type for the column. Create a column for each attribute of your Event entity. 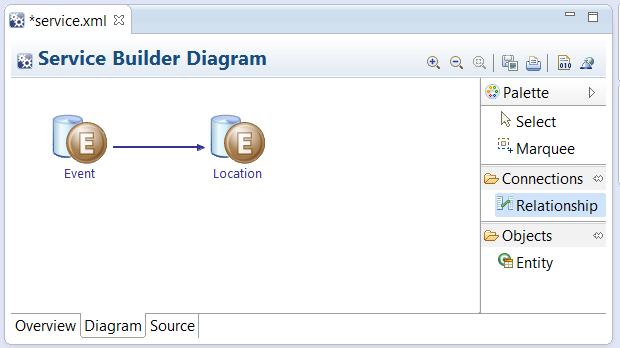 Repeat the steps to create columns for each attribute of your Location entity. In addition to columns for your entity’s primary key and attributes, we recommend including columns for site ID and portal instance ID. They allow your portlet to support the multi-tenancy features of Liferay, so that each portal instance and each site in a portal instance can have independent sets of portlet data. To hold the site’s ID, add a column called groupId of type long. To hold the portal instance’s ID, add a column called companyId of type long. Add both of these columns to your Event and Location entities. Lastly, add columns to help audit both of the Event and Location entities. Add a column named createDate of type Date to note the date an entity instance was created. And add a column named modifiedDate of type Date to track the last time an entity instance was modified. Great! Our entities are set with the columns that not only represent their attributes, but also support multi-tenancy and entity auditing. Next, we’ll specify the relationship between our Event entity and Location entity. Often you’ll want to reference one type of entity in the context of another entity. That is, you’ll want to relate the entities. We’ll show you how to do this in our example Event Listing portlet project. As we mentioned earlier for the example, each event must have a location. Therefore, each Event entity must relate to a Location entity. The good news is that Liferay IDE’s Diagram mode for service.xml makes relating entities easy. First, select Diagram mode for the service.xml file. Then select the Relationship option under Connections in the palette on the right side of the view. This relationship tool helps you draw relationships between entities in the diagram. Click the Event entity and move your cursor over the Location entity. Liferay IDE draws a dashed line from the Event entity to the cursor. Click the Location entity to complete drawing the relationship. Liferay IDE turns the dashed line into a solid line, with an arrow pointing to the Location entity. Save the service.xml file. Congratulations! You’ve related the entities. Their relationship should show in Diagram mode and look similar to that of the figure below. Figure 4.3: Relating entities is a snap in Liferay IDE’s Diagram mode for service.xml. Now that our entity columns are in place, let’s specify the default order in which the entity instances are retrieved from the database. Often, you want to retrieve multiple instances of a given entity and list them in a particular order. Liferay lets you specify the default order of the entities in your service.xml file. Say you want to return Event entities in order by date, earliest to latest, and you want to return Location entities alphabetically by name. It’s easy to specify these default orderings using Liferay IDE. Switch back to Overview mode in the editor for your service.xml file. Then select the Order node under the Event entity node in the outline on the left side of the view. The IDE displays a form for ordering the Event entity. Select the Specify ordering checkbox to show the form for specifying the ordering. Create an order column by clicking the add icon (a green plus sign) to the right of the table. Enter date for the column name to use in ordering the Event entity. Click the Browse icon to the right of the By field and choose the asc option. This orders the Event entity by ascending date. To specify ordering for Location entity instances, follow similar steps but specify name as the column and asc as the select by value. The last thing do is define the finder methods for retrieving their instances from the database. Finder methods retrieve entity objects from the database based on specified parameters. You’ll probably want to create at least one finder method for each entity you create in your services. Service Builder generates several methods based on each finder you create for an entity. It creates methods to fetch, find, remove, and count entity instances based on the finder’s parameters. For our example, we want to find Event and Location entities per site. We’ll specify these finders using Liferay IDE’s Overview mode of service.xml. Select the Finders node under the Event entity node in the outline on the left side of the screen. The IDE displays an empty Finders table in the main part of the view. Create a new finder by clicking the add icon (a green plus sign) to the right of the table. Name the finder GroupId and enter Collection as its return type. We use the Java camel-case naming convention in naming finders since the finder’s name is used to name the methods Service Builder creates. The IDE creates a new GroupId node under the Finders node in the outline. We’ll specify the finder column for this group ID node next. Under the new GroupId node, the IDE created a Finder Columns node. Select Finder Columns node to specify the columns for our finder’s parameters. Create a new finder column by clicking the add icon (a green plus sign) and specifying groupId as the column’s name. Keep in mind that you can specify multiple parameters (columns) for a finder; this first example is kept simple. Follow similar steps to create a finder to retrieve Location entities by groupId. Save the service.xml file to preserve the finders you defined. When you run Service Builder, it generates finder-related methods (fetchByGroupId, findByGroupId, removeByGroupId, countByGroupId) for the Event and Location entities in -Persistence and -PersistenceImpl classes. The first of these classes is the interface; the second is its implementation. The Event and Location entity’s finder methods are generated in the -Persistence classes found in your /docroot/WEB-INF/service/com/nosester/portlet/eventlisting/service/persistence folder and the -PersistenceImpl classes found in your /docroot/WEB-INF/src/com/nosester/portlet/eventlisting/service/persistence folder. Terrific! You’ve created the example service and its Event and Location entities for the Event Listing portlet project. We’ve made the source code for the service and the entire Event Listing portlet project available in the Dev Guide SDK which you can browse at https://github.com/liferay/liferay-docs/tree/6.1.x/devGuide/code/devGuide-sdk. The project is in the SDK’s portlets/event-listing-portlet. folder. <!DOCTYPE service-builder PUBLIC "-//Liferay//DTD Service Builder 6.1.0//EN"
Now that you’ve specified the service for the Event Listing portlet project, let’s build the service by running Service Builder. Then we’ll look at the code Service Builder generates.